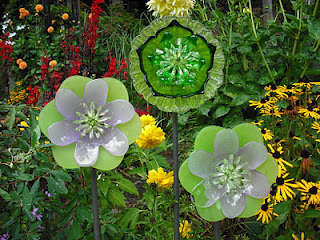 If you do not have the patience to grow real flowers, or if you do love to garden and add art pieces as accents to your garden, you are going to love these glass flowers, made from recycled materials. They are the perfect upcycle project for the summer time, and make beautiful gifts for others too. 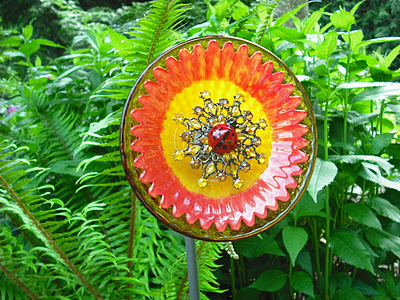 This is the perfect time of the year to start collecting pieces to make these glass flowers too, since garage and estate sales are prevalent this time of the year. Spend a weekend shopping for used dishes, bowls, and more that you love. Look for shapes and colors that will blend well, and nest inside each other. 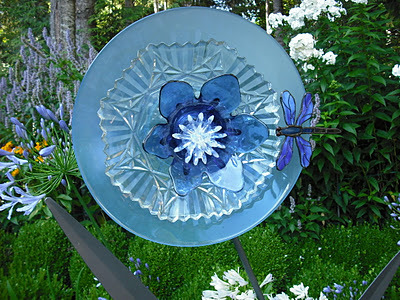 If you are interested in making the glass flowers for your garden, here are some tips to use while shopping for the glass (and then see below on how to make the glass flowers with plates and more)! *Start by searching your own cupboards to see what dishes you might already have on hand. It could be a great way to display that special dish you have been holding onto from your great grandma for instance. *Other great sources for dishes are thrift shops (shop their sale days), garage sells and neighbors and family members (let them know to drop their unwanted dishes off with you. *Think beyond just your standard dishes. For example large bowls or chargers make great larger flowers. Old glass ash trays make nice centerpieces for the flower s, and bowls and small vases will make a nice funnel looking flower. *If you have storage space, stack all of your plates you are collecting on a shelf. It makes it so fun to mix and match and design flowers that way (and my kids love to get involved and get creative too)! 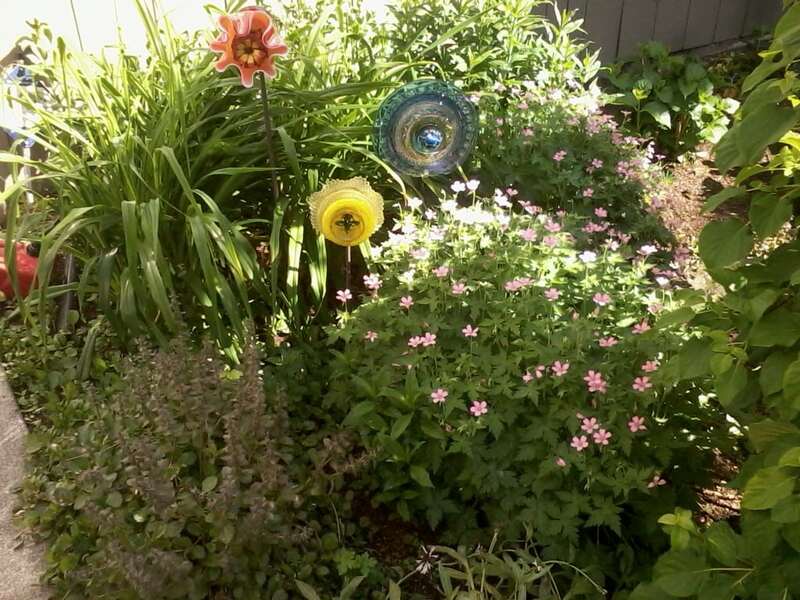 The photo below is my front yard in the summer with my glass flowers. 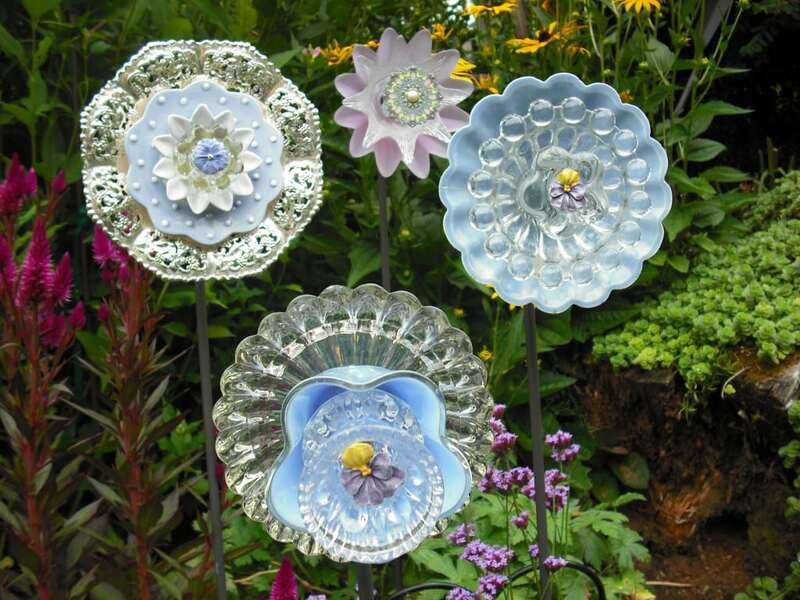 Most of my flowers are growing but not blooming yet, so I use glass flowers made from recycled dishes, to brighten it up during all seasons. The photo at the top of the page is my moms garden, and she uses bouquets (three similar looking flowers grouped together), to create statements in her gardens. 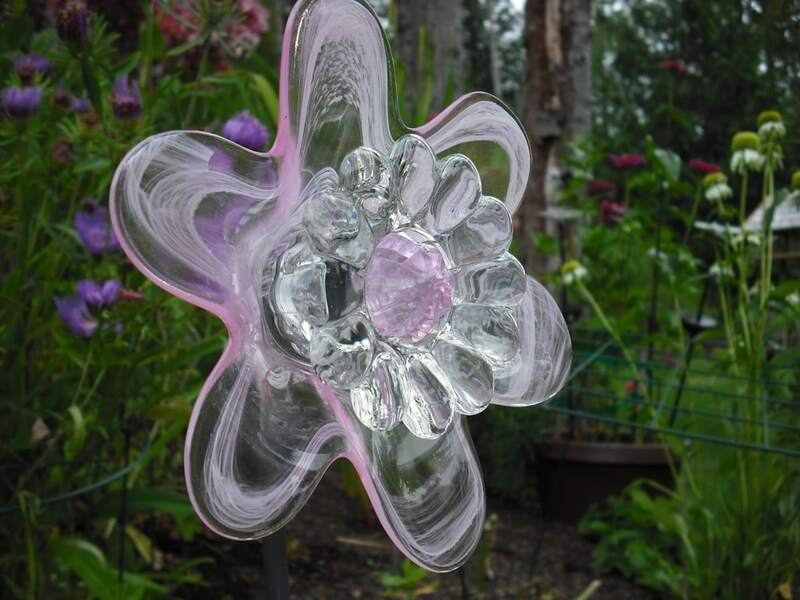 I am very fortunate in that my mom (Debi) owns Misty Meadow Gardens (the maker of all of the glass flowers art work you see in these pictures). She drills her glass flowers with a diamond drill bit and creates stems out of custom made iron work they create on site. These flowers are pricey. They can cost upwards of $100. The good news though, is that she has shared some tips with us on how you can make your own version of this glasswork on a dime (a $5 version and a $10 version)! 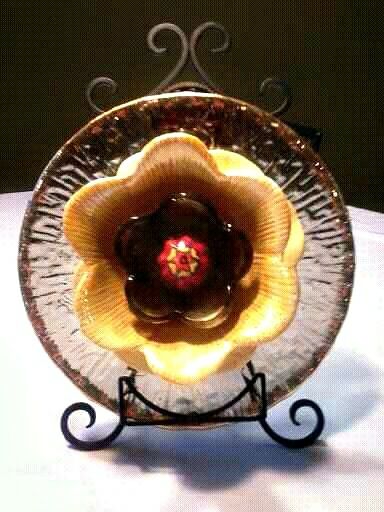 I have had the pleasure of making a few of these glass art beauties with my mom. We start by playing around with all of the glass, nesting one piece into the next until we find a look we like. They use a diamond bit (and wear protective glasses) to carefully drill a hole in the center of each dish. The pieces are then held together with a basic nut and bolt system. They make their own iron stems, but we have some other DIY options below. 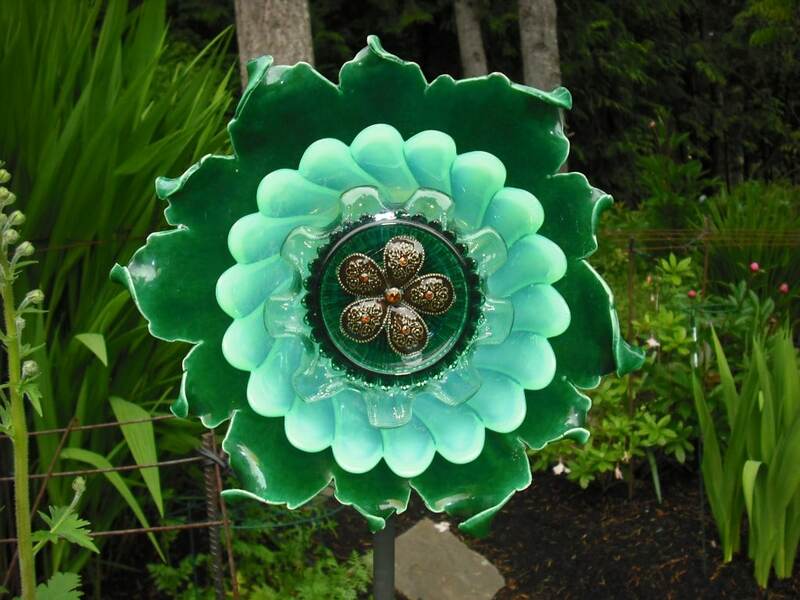 Here are some more examples of flowers she has made from reclaimed dishes! Glue butterfly’s, lady bugs, dragon flies, or whatever other creatures you can find to the side of your plate for extra drama. And one we made from a silver charger in my front yard (shown below). I have seen these go on sale for around $1 before – so its a fun option too. They get great reflection from the sun! 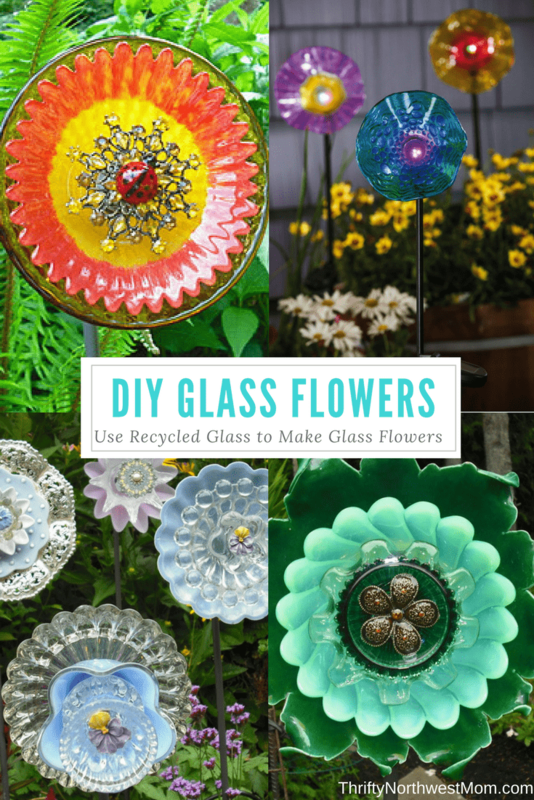 Here is how you can make your own version of these beautiful glass flowers from items you may have at home, find at a garage or thrift sale, or barter with your friends for. Display them in your house, use them as gifts, or hang them on walls in your garden. However you choose to display them, they are likely to be a big hit with visitors. To display in a garden, you can either add a picture hanging piece on the back and hang on a fence, or put a nice solid wooden stake in the ground and mount on that. Under $5 for flower shown above, cost will depend on what you pay for your plates. The most important part of this project is finding the glassware. We found ours at a local second-hand store. The largest size plate for this flower was a salad plate. That plate and the two yellow plates where $.97 ea. The small flower in the middle was a tealight candle holder we paid $.50 for and the decorative button in the middle was a piece we pulled off a pull knob (another $.50). The cost of our plates was $3.91. The plate holder was one we found at the dollar store for you guessed it, $1. I used glue left over from a cake stand project I did, but you will pay anywhere from $1 – $4 for glue (my dollar store sometimes carries epoxy glue for $1). The first thing to keep in mind when shopping for glass is to think of the big picture. Each of these pieces on their own might be considered a bit tacky. Take the gold plated cat plate pictured above, that we used for the back of our flower. This is actually 14 carat gold, so a special plate, but because it looked a little dated on its own we got it for a great price. You also want to think about dimensions. Things that fit inside each other, and give a more traditional flower look to them work well. You can use bowls if you want a more dimensional piece (a vase was used for the orange horn style flower pictured above). We started by putting a bead of glue around the bottom of the second largest plate and gluing it to the center of the gold cat plate pictured above. If using the epoxy glue method, allow to dry 5 minutes before starting next layer for best results. We repeated that step for the rest of the layers as well, allowing to dry between layers. Once you are finished with your flower you could use the same glue method to attach a plate hanger to the back of your flower, or get a plate stand to use to display it in. Its that easy, but makes a gift people will be talking about for a very long time. They are great dining room display, you could use pastel colors for a nursery gift, or do something in green and red to use as a host/hostess gift for a Christmas party. I will be putting this one in my office, just for something pretty to look at. Want to dress it up as a $10 version? They sell gold charger plates at my local dollar store, or there were some very nice gold plated chargers I found at Ross for $2 each. That would make a very fancy backing if you wanted to turn it into a more grand display. Your still well under $10 if you use an affordable charger. I have this rustic Italian style charger lying around my house (my little ones broke the matching ones….so I am stuck with nothing to do with this one). You could use it as a backing for a nice eclectic piece of art. When all was said and done, I liked the small flower, so I did not end up glueing it to the larger charger plate, but it’s an option. 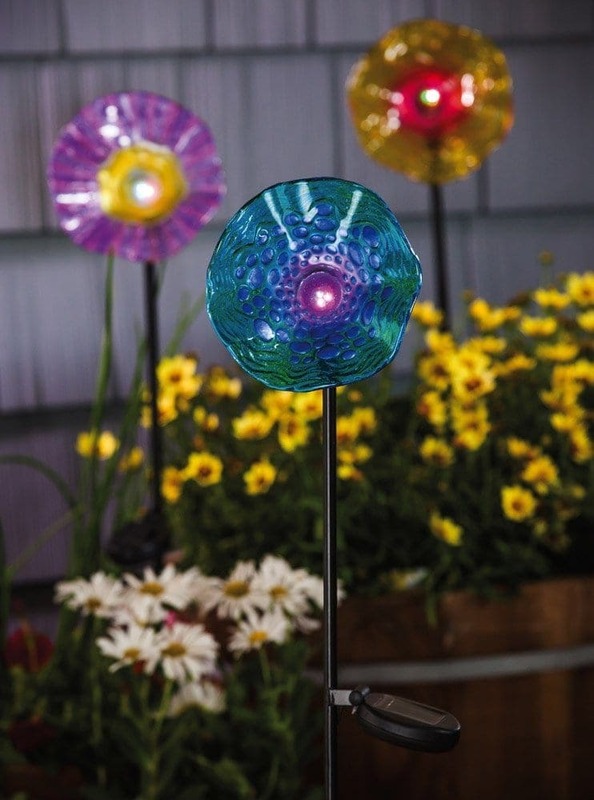 Do you plan on trying your hand at the glass flowers? Be sure to share a photo with us on Facebook to see what you create!